Alice Coltrane Turiyasangitananda—a chosen name meaning "the transcendental lord's highest song of bliss”—was a jazz innovator who made a life of self-reinvention. After the death of John Coltrane, her partner in music and life, Alice found Indian spirituality, started an ashram in California, and became a practitioner of Vedanta. Surya Botofasina grew up on the ashram, and will lead the celebration of Alice’s life and music at the 2018 BAM Next Wave Festival Oct 10. What follows is a truncated Q&A with Surya Botofasina, now a New York City resident, as told to Andy Beta of Pitchfork. I was born in Northern California and raised on the Sai Anantam Ashram in Southern California. We first lived at the Vedantic Center in Woodland Hills during the first few years of my young life and then the rest of my formative years were spent at The Ashram in Agoura Hills. I was five years old when The Ashram moved in 1982. What was a normal day like? I remember playing outside a lot. The beautiful thing about being on such a large parcel of land is that there’s a lot to do. There’s a lot to explore in a safe environment. We spent a lot of time in the creek. It was a lot of country living aspects that you just don’t get every day and certainly my children won’t be experiencing that. I would go to the creek and try to catch a crawfish or frogs and skip rocks. That was a daily occurrence. Someone put up a basketball hoop and that’s how I learned how to shoot. My best friend and I set up a backyard baseball stadium. People were getting rid of some old doors and my mom let us use them, like our own version of the Green Monster in Boston, so we tried to make a tall fence out of them. There was a lot of that kind of imaginary play. You still see kids play like that. At some point, there was a playground and swing set and it was just us running around. Did Swamini live in The Ashram as well? She stayed at her residence in Woodland Hills for the duration of her life but she came down daily. It was 12 miles away but it only took 15 minutes by car to get to The Ashram. During the latter portion of her life, she was there less, but at least three times a week. Her “presence” was daily. Her physical presence was felt frequently because there were events on Wednesday night and Sunday. Consistently, it all revolved around Sunday. That was it. That was the…(pause) that was the day when time was not able to be calculated by the measures that we use today. Sunday...I was just talking to another ashram kid about this. For us as kids, we’d get up and know we had to get ready for Sunday school. Or, as they called it Bal Vikas. It was taught by one of the parents. You’d put on your Sunday best, usually white clothes, which we’d usually get dirty by lunch. We’d start in Bal Vikas and then Swamini would arrive after Sunday school. Can you tell us about Swamini arriving? When you’re standing in front of the house where I grew up in you can see the road above her home and standing there, you could see cars coming up and over. It was very distinct when Swamini came. It would be an early afternoon arrival. She had this distinctly maroon Lincoln-Continental and you could hear the music blasting from her car. Inevitably, less than a minute later, her car would pull around and the bhajans would be blasting at a nice volume level. Whether she was driving, her son or sister was driving, she’d get out and she had on her distinct orange robe and that’s when the day really began. That’s when time wasn’t a factor any longer. There would be a moment of pause and then she would turn on the organ and the takeoff would begin! Were the bhajans evocative for you immediately? Or did it take awhile for them to sink in? As kids we would either play outside or be told to go to join our parents inside the mandir. That’s where I got my first exposure to the bhajans. I remember it very clearly. Over the years, as we got older, from a 7 year-old to a 13-year-old and beyond, that’s when we didn’t go to Sunday School so much, but down to where the adults were and listen to what she had to say and be a part of the music. It was a big deal. At first the music just felt good, it felt unique –I never heard anything quite like this—I didn’t hear much that sounded like this and my mom was also a musician. My mom started me on piano lessons when I was in the second grade and years later when I was trying to play jazz as a teenager. For me, the music of the bhajans really began to take form and shape as I grew older. In one sense, I would hear it in this healing, uplifting aspect. And then later on, as my musical ear became more of my bag, I started to hear the technical prowess and that was another level of “wow.” I can’t believe she’s playing a melody with her left hand, chords with the right hand, bass and volume pedals with her feet and leading a choir all at once. I’m under the impression that even if you were familiar with these psalms from India, her versions of these bhajans are different. There are differences and there are similarities. An African-American woman from Detroit brought something unique and musically rich that’s clearly brought to these bhajans. But, there are still a lot of things that are very traditional. In its simplest form, bhajans are call-and-response, as were the bhajans that we sang on a weekly basis. The gentlemen would start or the ladies would start. The tempo would increase at the second go-round, which happens with them in India. You hear that a lot also in gospel, the tempo goes up after a little bit and the energy changes. Did you ever have lessons with Swamini? I never had formal lessons with Swamini. Where I got my most personal instruction from her was when I was learning the text of the Bhagavad Gita, there are melodies that run along with the text. It’s a story about self-realization, where the god Krishna is speaking to Arjuna and showing the way of enlightenment. It’s about how to live your life to achieve that ultimate bliss. There are melodies that go along with these verses from the book. There would be a keyboard set up in our small classroom and she would teach us the book. And as the only person in our class who played, I would literally lean out of the way and she would play something and I had to learn it that way. It comes by once, try to get it or jot it down. I got a chance to play the bhajans in The Ashram. One time, she was kind enough to come and allow me to play right next to her as she played the bhajan. She was kind enough to adjust the key to how I had learned to play. I’ll never forget an experience where she showed me as we were playing and she would just call out the chords: “A-flat, G, E-flat” and then at one point she said: “Just play.” Music is a very aural thing that we learn with our ears. It’s a primary version of learning music; very rarely do you learn to play music by learning a score. That’s how she was teaching me. Then when there were different things I was trying to learn and figure out on my own, I would try to play it for her and she’d give me different pointers. Overall it was just encouragement. She also gave me the chance to experience the biggest stage when I was still young, playing at the John Coltrane Festival. Did you have a sense of her as a person? How does growing up in The Ashram still inform your daily life? I have children of my own now and it informs my daily life and the values that I want to bring to them. For lack of a better way of putting it, I just want to be a good person. I want to be able to put my best foot forward and I want to leave something for the next generation that will hopefully inspire them to be a better person themselves and be kind and generous, to be all the qualities that I admire most about her. The music itself I find to be very therapeutic. Living here in New York City can be a very noisy experience. When I start my job in the mornings, I put on my headphones and listen to bhajans and I’m transported right back to home. I can see the water going through the stream. I can see the brightness of the sunlight on the steps. I can see the blue carpet on the floor in the mandir. I can see her sitting at the organ and smiling as she’s directing us to sing. That kind of inner peace is something I feel in the bhajans and I’d like to pass that onto my children, because I want them to be happy and I want them to feel at peace in this very interesting time that we’re living in. What is the importance of making sure that more people can hear the ashram tapes? The importance of preserving the music is just simply for one reason and one reason only: I think it can make the world a better place. I think it can make people see the best part of themselves and offer that best part of themselves to others, not just to people they know but to complete strangers, to open our heart to the generosity of our own limitless possibilities that our kindness can bring. To find a strength and humility. That’s why I feel the bhajans are so important to me. Not to mention it’s really good music. On a basic level, it’s good, interesting, wonderful and accessible music. I find music that’s very high level that sometimes you have to listen to it a bunch of times just to understand it. You have the Beatles’ “Yesterday” and “Georgia on my Mind” and it’s just there and so palatable. Although the bhajans are in a different language, there’s a nice meditative aspect. And nowadays people are hip to yoga and meditation and you can say “ashtanga” and people will know what you’re talking about. In that regard, I’m very happy that it can be even more a part of the modern day conversation. 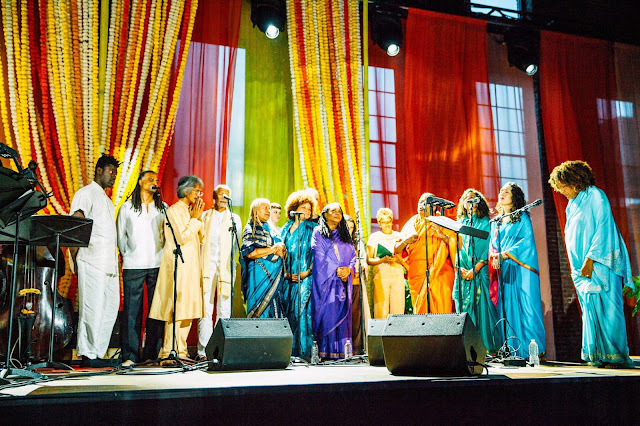 The Ecstatic Music of Alice Coltrane comes to the BAM Howard Gilman Opera House October 10, and great tickets are still available.